I ran fifteen miles, the longest run of the training so far, in the last of the good weather for a while. Though sunny, in the latter stages I felt the cold wind and my hands were frozen by the end. My toes hurt too, but I see the doctor on Tuesday. I shall show him these, taken as soon as I could peel my socks from my feet. I ran along Seaford front, then up the ridge to the west of Bishopstone to Beddingham Hill, then to Firle Beacon and back to Seaford. The paths were dry and hard; a lark sang; turning a corner I came upon a tree in blossom with an unusually rich scent for the time of year. Although this route feels very hilly, I see it includes 1665 feet of ascents, only a little more than Hastings, which was 1593 feet. Five weeks till the London marathon. My toe, the fourth on the left foot to be precise, is better. It still looks strange, and feels numb, but always has; a physiotherapist was once lost for words at my curious feet, when I took off my shoes and socks to show him. I have run twice since Hastings, over short distances, but without pain. I have had a rather unsuccessful telephone consultation with the doctor which ended, predictably, in his admitting that a telephone diagnosis was not possible, and a face-to-face consultation with a kind nurse who did not, thankfully, forbid me for running. I see the doctor for something more definitive next Tuesday. I also bought new running shoes, the first for two years. In the picture, the new ones are the pristine pair on the left, and are, shoe fetishists will recognise, a pair of Brooks Addiction 8s. The other two pairs, Brooks Addiction 7s, were both bought about the same time, in the days when I could run at work and kept a pair at work and a pair at home. They have served well, and are remarkably unworn. In them I have run at least four and possibly five marathons, along with lesser races and the necessary training. I have two runs to report: on Tuesday I ran up Seaford Head on the South Barn route, then down into the Cuckmere valley and back up Seaford Head again, and on Thursday I ran a short way along the front. I took part in the twenty-fifth running of the Hastings Half Marathon, though I can only claim to have run it six times. It was a beautiful sunny day for spectators, though a little too warm for comfortable running. I saw several casualties on my way round.. I managed 2:04:09 according to my Garmin, though this was the course on which I achieved my personal best for the distance, twenty minutes less. The event is well-supported, with flags, pipe-bands, jelly-babies and oranges. There seems to be a considerable Cornish diaspora in Hastings, to judge by the Cornish flags that cropped up along the route. 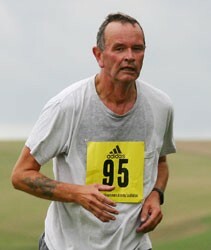 Once more I ran in a Seaford Striders shirt, which gained some cheers from spectators. The first section was very busy and it's easy to waste energy dodging other runners. Then at three miles, a long two mile ascent challenges the runner. I did not look forward to this, but kept at it; at this stage my pace was still good, but at the top the Runners World 9 minute mile pacer passed me and left me a long way behind. Then came the ridge, with fine views over Sussex and Kent, the descent into the Old Town and the final slog along the sea front. Once more, as at Eastbourne two weeks previously, I had little left, and was only able to manage a slight acceleration at the finish. Also as at Eastbourne, I had toe trouble. One of the toes on my left foot, the fourth, for a couple of years has felt loose when I run; that is to say it seems to wobble about in my running shoe, as if about to detach itself from my foot. This has been disconcerting, but not, until recently, painful. Towards the end of both races, it started to hurt a lot, simultaneously numb and tingling, with a sharp pain that seem s to drive back into the foot itself. I am going to take it to the doctor. I hope I am not about to imitate Ms Radcliffe and have to withdraw form London with a broken fourth metatarsal. I have no great progress to report. Yesterday I did about nine miles, up to High and Over, then to Fiveways and back to the sea and along the front. I say about as I am still finding the new Garmin difficult. I fear it may be a bad unit and I shall have to send it back. It was very windy and hard work. It's time to reassess the long runs ahead: after next week's Hastings half, I run 20, then 15, then 20, then 15, then 10. I ran last night with the Seaford Striders round the town's hinterland and back along the sea front. I am still struggling to understand my new Garmin, so only got it to start recording the run half way through. I'm told it was about six miles, and I went with the medium pace group, though I must say I find them fast; even the dog is faster than me.. I hope the battery improves. It was fully charged on Friday and left in power-save mode for most of those three days, apart form two and a half hours ruing, and perhaps another half-hour when it was on as I set it up. The advertised battery life is two weeks in power save mode, and eight hours with GPS on. I was delighted to learn that I am one of the three lucky winners of a cookery book in a competition on the splendid JogBlog's blog. My prize is a copy of Veg: The Cookbook by Gregg Wallace. My winning comment and the others may be seen here. Ms JB describes her runs through the mean streets of North London in a unique voice, as a Joycean stream of consciousness. Her statistics too are a joy. I have often thought of adopting the idea here, as a hommage but I am sure I could not carry it off as well as she does. I ran the Eastbourne half marathon yesterday in 2:01:53, being 549th out of 900 finishers or thereabouts. The time itself is acceptable. I would rather not have been on the wrong side of the two hour barrier, but under the circumstances, a reduced training programme on doctor's orders, and no running at all since last Sunday, I'm not too disappointed. But I did not enjoy the experience. My feet, knees and toes hurt from about eight miles onwards, I had nothing extra left for the finish, and I had odd cramps and pins-and-needles afterwards. These physical symptoms are as nothing compared with the existential runner's crisis I had in the latter stages. While the early stages of the race take runners through the Victorian and Edwardian villas of Meads, up an impressive hill, and then a nice fast downhill, followed by a stretch along the front, the latter half goes through the new, but already shabby, Sovereign Harbour. Twisting and turning round the housing estates and the harbour itself, I wonder why, as a rule, the east end of a town or city is always the rough end. For all the yachts, whose owners can probably no longer afford them, the development looks as if it is on its way to slumhood. Some good things: crowd support was enthusiastic and cheered me up no end. I ran for the first time in Seaford Striders kit though I think most of my fellow Striders finished way ahead of me. One of us, Geoff Gray, won the men's race in 1:16:36.